"We did it. We made two miserable people happy!" Netflix has debuted the first official trailer for a new romantic comedy titled Set It Up, arriving in the middle of June to liven up your summer days. 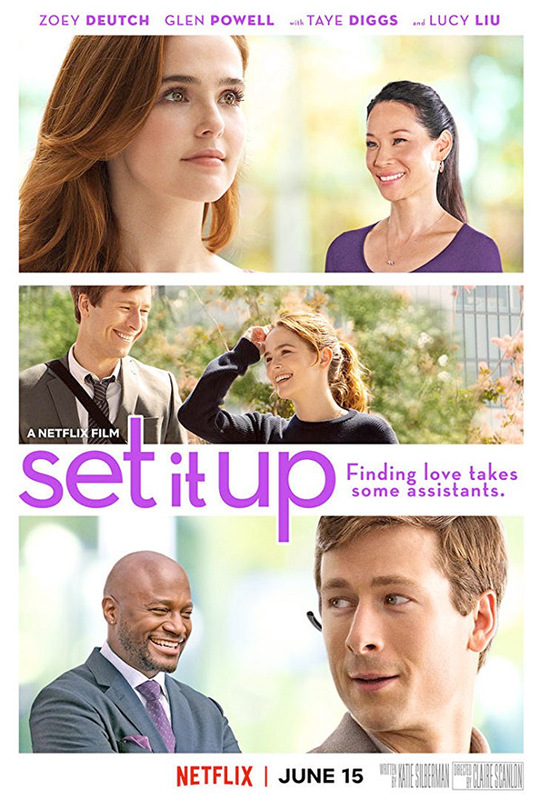 Set It Up is the feature directorial debut of TV director/editor Claire Scanlon, and the story follows two assistants for executives in New York City, who try to set up their bosses to fall in love. As usual, not only does comedy ensue, but all kinds of romantic sparks fly and awkward things happen. Zoey Deutch and Glen Powell star, with Lucy Liu and Taye Diggs, as well as Noah Robbins, Jon Rudnitsky, Tituss Burgess, Pete Davidson, Shyrley Rodriguez, and Meredith Hagner. This looks expectedly cute and mildly amusing. New York assistants, Harper (Zoey Deutsch) and Charlie (Glen Powell), are used to going above and beyond for their high-powered (and highly demanding) bosses, Kristen (Lucy Liu) and Rick (Taye Diggs). But now they're teaming up for the biggest projects of their young careers -- getting their bosses to fall in love! Only time will tell whether they strike out… or score a home run. Set It Up is directed by American filmmaker Claire Scanlon, making her feature directorial debut after lots of TV work including episodes of "Fresh Off the Boat", "Unbreakable Kimmy Schmidt", and "Brooklyn Nine-Nine"; she's also formerly an editor on "The Office", "Top Chef", and other shows. The screenplay is written by Katie Silberman. Netflix will release Scanlon's Set It Up streaming exclusively starting June 15th this summer. Who wants to see it?